Fits Outside Tile Dimensions: 6-1/4" x 16-1/2" to 8-1/2" x 19"
The Set of 3 Gelco Stainless Steel 8 in. x 17 in. Base Single-Flue Chimney Caps is among the most popular chimney cap sets from the Gelco lineup. 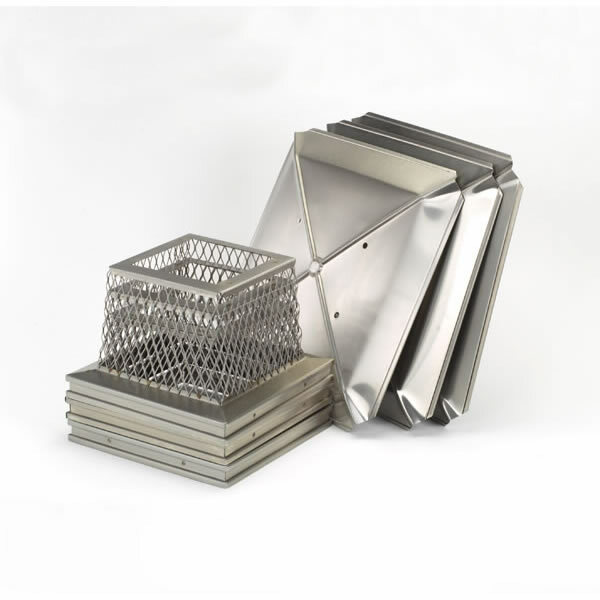 This stainless steel chimney cap set is available in a range of sizes and comes with a lifetime warranty on manufacturer's defects and rust, regardless of what type of fuel is used. The design of this model Gelco Chimney Cap grips the flue tile with pointed, slotted hex-head set-screws allowing you to tighten down as much as needed. The chimney caps' 18-ga., 8 inch high, one piece screen has 3/4 in. mesh. There's no reason to let animal pests, moisture, or debris get into your chimney and cause expensive damage, especially when there's such an attractive option available.The Set of 3 Gelco Stainless Steel 8 in. x 17 in. Base Single-Flue Chimney Caps features the traditionally fine workmanship of all Gelco Chimney Caps such as the special cross break that gives each 24-ga. chimney cap lid extra strength and durability, along with the classic, perfectly styled look to fit almost any home's design.